The growing interest in using combination drugs to treat various complex diseases has spawned the development of many novel statistical methodologies. The theoretical development, coupled with advances in statistical computing, makes it possible to apply these emerging statistical methods in in vitro and in vivo drug combination assessments. However, despite these advances, no book has served as a single source of information for statistical methods in drug combination research, nor has there been any guidance for experimental strategies. Statistical Methods in Drug Combination Studies provides researchers with a solid understanding of the available statistical methods and computational tools and how to apply them in drug combination studies. The book is equally useful for statisticians to become better equipped to deal with drug combination study design and analysis in their practice. "This book is a welcome addition to the literature and fills a needed niche since last book written on drug synergism was over 15 years ago . . . each chapter presents a different technique for solving common challenges in the development of drug combinations. . . Overall, this book serves as a good reference for both researchers in the field of statistics and drug combination development." "Investigating drug combinations is a steadily growing area in preclinical and clinical research.As usual, specific statistical methodology is needed to handle these kinds of trials. . . .the book is generallywell structured and the majority of sections actually builds up on and refers to each other. 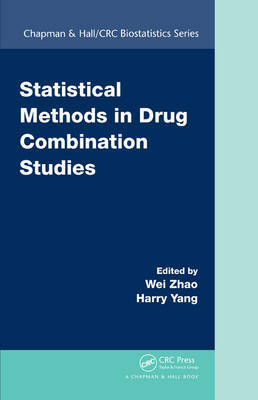 This book provides a good overview on and a good introduction to the topic of statistical methods for drug combination studies, especially regarding the preclinical part."